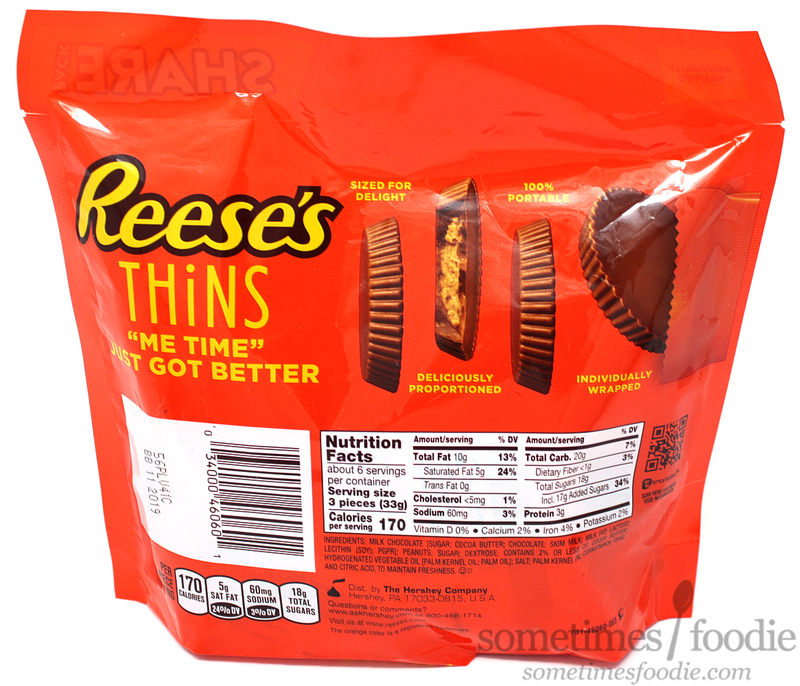 Sometimes Foodie: Are Reese's Thins The New Oreo Thins? The "thin" trend has taken over the cookie aisle, and now it's made it way into candy. How to Reese's Thins compare? Unlike Oreo, who had a fairly modest release when their Thins were introduced, Reese's is going ALL in. Not only did they release it in both dark and milk chocolate varieties right off the bat, but they also offered a bunch of different sized packages. Whole-sale clubs got a 24 oz. plastic tub, there's the 7.37 oz. shareable bag (which I bought), a smaller 3.1 oz. peg-style bag, and a 19.78 oz. bag of 50 chocolates that I have seen online. All of these options use the same, individually wrapped, candies in familiar orange-colored plastic pouches, but you'll find that the little brown paper cups are nowhere to be found. Unwrapped, these are pretty thin alright. They're roughly half the height of an average full-size Reese's cup. Taking a bite, the peanut butter center seems significantly more creamy than other versions of Reese's cups, which tend to be crumbly, and the flavoring seems a little bit more authentically peanut-butter like than usual as well. I hesitate to say this but I think the chocolate might be a bit creamier, as it melts so nicely on the tongue, but that might be due to the thinner shape while the quality has remained the same. I can't really tell. These do not taste drastically different from other iterations of Reese's cups, but their thinness does give them a lighter creamier quality which makes them highly snackable. I could not eat just one, and neither could my fiance, but since they are each individually wrapped there is a slight hesitation to just going through and devour the whole bag Oreo-Thin style. Seeing a pile of wrapper-corpses on my desk makes me feel guilty enough to stop after just 2 or 3, but even with the guilt, I just don't feel as satisfied as I do with normal or seasonal shaped Reese's cups. 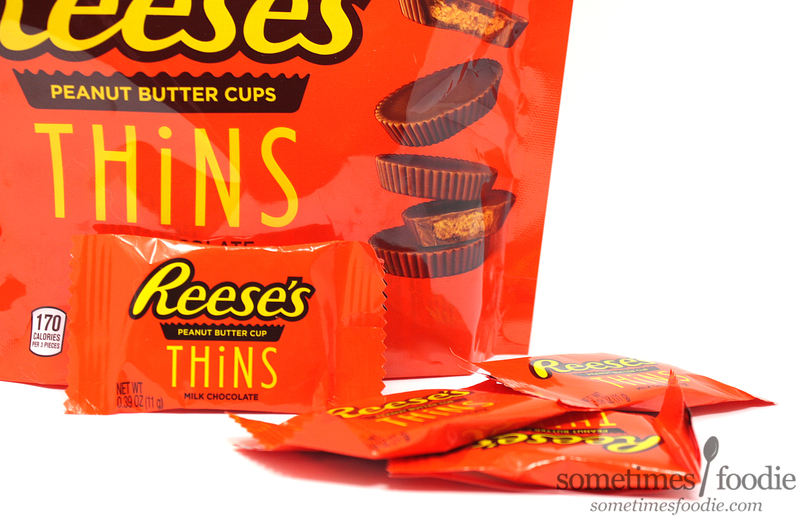 I stacked two Reese's Thins on top of one another and I found that that was a really satisfying candy experience, but that that point, why not just eat a normal Reese's cup? In the end, these are delicious, and high snackable, but they just aren't as successful as the Oreo thins. I think their individually wrapped nature might have something to do with that. 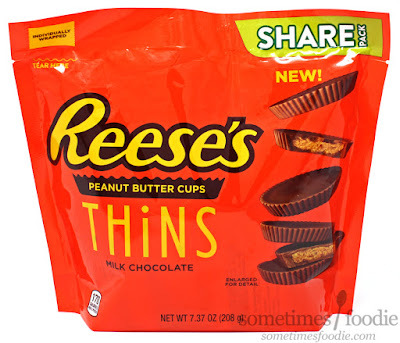 Still, these taste great, melt in your mouth, and have all the flavoring you know and love in other Reese's cup, it's just thinner, less crumbly, and less satisfying on an individual level. I personally love the crumbly texture of a classic Reese's, and I prefer all the seasonal shapes which have the perfect chocolate to peanut butter ratio, but these certainly aren't bad and I'm interested in trying the dark version which could bring something new to the table. Let me know i you've given these a try and what you think. 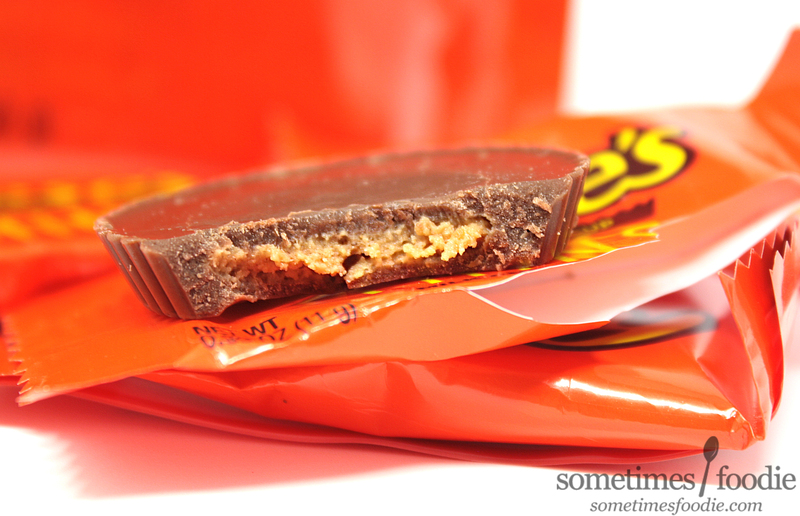 Are they better than Normal Reese's?